With Now is the Time as its theme, this year’s Utah Rural Summit features keynote addresses from internationally acclaimed community development author Doug Griffiths, Utah Governor Gary Herbert, and a panel of Utah’s Silicon Slopes executives discussing how to bring technology jobs to rural communities. Other conference presenters include Strong Towns chairman John Reuter, and nationally honored entrepreneur Sarah Calhoun, as well as numerous business leaders, state officials, and local leaders. 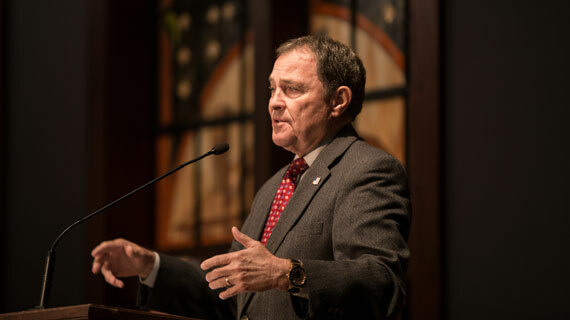 This year marks the 31th anniversary of the annual Utah Rural Summit, making it the longest running rural development conference in the nation. The Rural Summit is hosted by Southern Utah University’s Utah Center for Rural Life, and will take place August 2 – 3, 2018, in Cedar City, in the Hunter Conference Center, on the SUU campus. Attendees include government and business leaders from across the state, including legislators, county commissioners, city officials, economic development and planning professionals, and policy makers from both state and federal government offices. This year’s Rural Summit will also feature a panel presentation addressing the opioid crisis in rural Utah. Though seldom talked about, Utah is dealing with the devastating effects of opioid addiction throughout the state. Alema Harrington, widely recognized as a Utah Jazz broadcaster and former BYU running back, is also a recovering addict. He will join the panel to share his story and his passionate efforts to help those struggling to break free from addiction. The conference theme, Now is the Time, highlights the necessity of strengthening and investing in our communities while the economy is strong and resources are readily available. This theme is echoed by keynote speaker, Doug Griffiths, author of the highly acclaimed book, 13 Ways to Kill Your Community. “Everything is about to change. Don’t just be the leader, show leadership,” says Griffiths. Griffiths believes communities are the foundation on which we build stronger families, stronger businesses, and stronger nations. “Build strong communities, and success will follow.” He helps communities identify what is holding them back from finding success, and then helps them overcome it. Griffiths inspires by showing how communities are often destroying their own chance at success. With an eye toward the jobs and workforce needs of the future, Utah Lt. Governor, Spencer Cox will moderate a panel of Utah’s Silicon Slopes executives as they discuss the potential for moving technology jobs out to rural areas, and how to train the workforce needed to do these jobs. The Utah Rural Summit will also feature a panel of housing experts to address rural Utah’s housing shortage, as well as keynote address by John Reuter, from Strong Towns. Mr. Reuter asserts that many long-held assumptions about community growth and development are inefficient and not sustainable. He offers a different way of thinking about community development for the long-term. The Utah Rural Summit also features a number of breakout sessions covering a variety of topics, including natural resources, public lands issues, and workforce development. Registration and additional information about the 2017 Utah Rural Summit can be found at the Utah Links: Utah Rural Summit site, or by calling 435-865-7707.